Need to get from JFK Airport to Times Square in Midtown Manhattan? A surprisingly cost-effective way to travel is to hire a car service to get you into the city. Whether your travel is for business purposes or a well-deserved leisure trip, luxury car service is the way to arrive in style. The cost of traveling from JFK Airport to Times Square can vary a lot. Factors to consider are the size of your group, your comfort and the storage of your luggage, your destination, and flexibility of the company offering ground transportation. The set fare for a yellow taxi to anywhere in Manhattan is $52 for the trip plus charges for tolls, the $4.50 rush hour surcharge on weekdays between 4 and 8 pm, and a tip (15% or about $8). A shuttle will cost you between $20-25 per person, and direct bus around $18 per person (with kids under 3 traveling free). Make sure you understand train schedules and how long a connection might take. Where is your final destination? Will you need an additional taxi ride to get where you are going? Make sure you understand all fees involved and add them up for each person in your group. Is it still cost effective? Consider whether you feel comfortable navigating this system (which can be a little overwhelming to some), and with all your luggage. Fares may vary due to traffic, weather, and other factors. This rider fare estimate does not include flat rates, discounts, or promotions. Routes displayed are examples only and may not reflect the route on which estimates are based. Your actual fare will be the price presented upon booking. The difference between a car service and booking a ride with companies such as Uber and Lyft is the fact that drivers are highly screened and generally more experienced. You are also guaranteed the model and condition of the car that will pick you up. If you’re traveling with a large group, per person charges can add up quickly, and the need for multiple taxis might be expensive and inconvenient. If you have a tight schedule, make sure to understand the time involved for each mode of transport, including getting on and getting to your final destination. Understanding that your final destination is not simply “Manhattan” or even “Midtown Manhattan” can make a big difference to how much you ultimately spend on services listed above. The moniker Big Apple says it all, New York City is big indeed! Each person or group’s situation is going to be unique. When you travel by taxi or public transportation, you don’t get personalized service. You have to get your luggage to the curb from the terminal. However, when you book ground transportation with a car service, a professional chauffeur is waiting for you when you arrive. You can still choose curbside pickup, or schedule a meet-and-greet inside (picture a guy in a suit with your name on it). When you hire a car service, you will have assistance getting your luggage to the vehicle, and you can be dropped off at a precise location, rather than at a place which isn’t convenient or near your destination. Another advantage of private transportation between JFK and Times Square is the flexibility you’re allowed. When you request a quote or reserve your limo service, you can arrange for multiple stops or drop-off points. 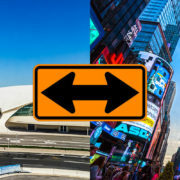 Consider including a sightseeing tour, so the drive from JFK Airport to Times Square becomes a part of your itinerary. You could even make reservations at one of the city’s excellent restaurants as part of the trip into Manhattan. When you’re traveling for work, it’s typically your company that is paying for your transportation. And for business, it is likely more important to be on time, prepared and relaxed, than saving a few dollars how you get there. That is why car services are standard for corporate travel. Rather than depending on a taxi or figuring out public transportation, work or relax in comfort for the duration of the trip, and make the right impression when you arrive in Wall Street. Our chauffeurs are professional, courteous, and get you to your destination on schedule. Call us to discuss plans for your trip. We can assist you with all arrangements and also ensure that you have transportation from Times Square to JFK with plenty of time to spare for your flight. We include up to 45 minutes free waiting time on domestic flights and up to 1-hour free waiting time on international flights.